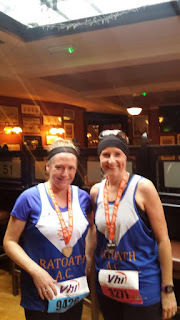 On a very wet bank holiday Monday, 3 of our Monday night crew braved the elements and ran the Womens Mini Marathon . Smashing their previous 10k times all 3 came in safely under the hour , setting new PBs and recieving very swanky engraved medals for their efforts . Sarah Jane Hallinan was our first woman home in a terrific time of 59:36 , followed swiftly by Joanne Carrigan ( 59:52 ) and Rachel Connolly ( 59:34 ).